There are a lot of IPA drinkers out there, but I get the feeling that there are just as many people who would enjoy the fruity-tropical flavors in New England IPAs, but were scared off by the IBU-arms-race of earlier this decade. I wanted to develop a session beer for Sapwood Cellars that showcases fruit-salad hoppiness without assertive bitterness. Sort of a Belgian white, with hops instead of spices. The result is a beer we're brewing 10 bbls of today... Ziparillo! 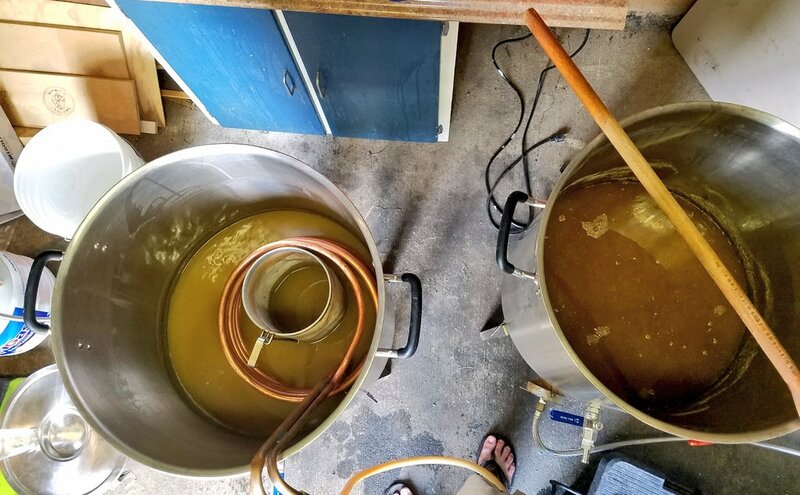 Dry hopping mid-fermentation is a great technique for chasing away raw-green hop aromatics that turn-off some drinkers. The problem is that adding hops early makes harvesting yeast far more difficult. Our solution was to use dried yeast. For a fraction of the price of a liquid pitch (~$60 for 500 g dried) it means we don't feel bad not cropping and repitching. Dry yeast also allows for easy strain blending by weight. In this case the test batch was 85% S-04 and 15% WB-06. The goal was to support the fruity hops with a little banana from the hefeweizen strain. An idea I first tried in my American Oat Ale. The grist is a callback to what we developed for Modern Times Fortunate Islands, still my favorite of their regular offerings. The grains were in turn inspired by Three Floyds Gumballhead. We decided to go a bit lighter on the wheat until we get used to how large amounts of huskless grains lauter on our Forgeworks brewhouse. Hot-side hopping is a single dose of Cascade in the whirlpool. A classic variety with a good blend of oils, but without excessive alpha acids (or cost). Despite that, for the up-scale we're going to lower the whirlpool temperature to ~195F with a barrel of cold water at flame-out to keep the IBUs under 20. Dry hopping with Amarillo for stonefruit aroma. Hefeweizen yeast, CaraVienna, Cascade, and Amarillo is a combination I tried back in 2010 for this Hoppy Hefeweizen. Not the same intended balance on that batch, but a similar palate of flavors. The wrinkle in this test batch was that I split it pre-boil. I've been editing Scott's draft for "The New IPA" and the research suggested that many hop oils peak very quickly at higher temperatures and then dissipate. 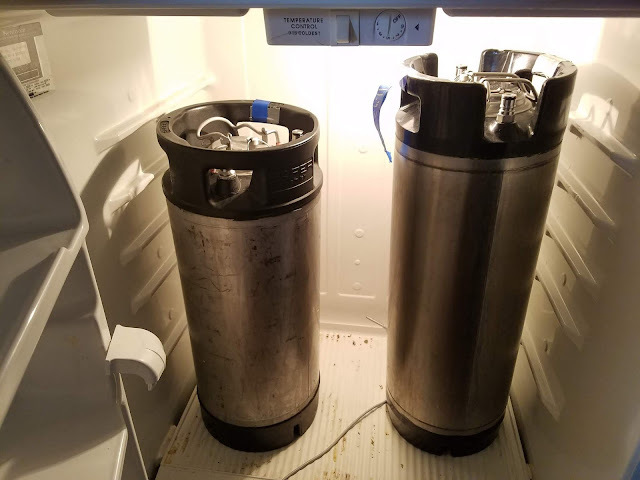 So I split the batch, half with a 20 IBU addition at 60 minutes followed by a flame-out addition immediately after turning on the immersion chiller. The other half I added a hop-stand/whirlpool addition allowing it to sit for 45 minutes before starting the chill. I even left the heat on low to better replicate the slow cooling of a commercial-scale whirlpool. Going in I was suspicious. I'd changed from quick-chilling to hop-stands a few years ago, and felt that my beers had gotten a better more saturated hop flavor. The beers came out surprisingly similar, but not exactly the same. Smell – Clean yeasty-doughy nose. Banana. Cascade grapefruitiness shines through as the dominant hop character. Certainly reminds me most of hoppy hefeweizens that I’ve brewed previously. Surprising how much yeast character there is from a low percentage of WB-06. Appearance – Pale-gold, mildly hazy of the standard hefeweizen type. Not milky-haze. Good head retention and cling. Taste – Bitterness is present, a bit higher than 20 IBUs in my estimate. Crisp finish with some lingering hop resin. Amarillo comes in a bit towards the end, apricot. Odd that I get the kettle hops in the nose and the dry hops in the flavor. The quick chill seems to have imparted a more dry-hop like character. Dry, with a finish that reminds me of some sort of herbal spritzer? Mouthfeel – Snappy, good firm carbonation, but not as high as a traditional hefe. Dry, slightly tannic finish. Drinkability & Notes – A nice session beer. The polyphenols from the early-boil addition may be making the bitterness come-across higher than the calculated IBUs would suggest. Changes for Next Time – Drop the bittering addition to 10 IBUs, and this would be much closer to the balance I was looking for. Nice as is, but likely too bitter for many hop-phobes. Yeast character is a bit distracting. Smell – Similar, but the yeast character comes across as leaning more bubblegum than banana. Slightly more phenolic as well, peppery. Hops are better integrated into the yeast character or maybe just less assertive. I get honeydew melon. Appearance – Identical. In this case the timing of the boil hops and speed of chilling doesn’t seem to have effected clarity. Taste – Bitterness seems lower/smoother, and the finish rounder despite the same calculated IBUs. Like the nose the line between fruity yeast and hops is less distinct than the other version. There is more banana than in the nose, but it is still relatively subdued. Hops are bright and citrusy. Mouthfeel – Smoother, less tannic. Coating compared to the other half. That isn’t a character that necessarily sounds beneficial to a session beer, but in this case it makes it easier and more pleasant to drink. Drinkability & Notes – Closer to what I was looking for, the hops and yeast meld together into a pleasant fruit salad. Rather than a generic fruitiness throughout the effect is different flavors from nose and mouth, evolving as it warms. One friend noted that it has sort of an Allagash White thing going on, which was exactly my intent. Changes for Next Time – We’ll be cutting the WB-06 from 15% to 7.5% in the big batch. The taller fermentor should suppress ester production as well. We’ll add a barrel of cold water at the end of the boil to lower the temperature and further smooth the hop bitterness contributed by the whirlpool addition. 5.28 at mash temperature after all additions (~5.5 corrected to room temperature). 1. 1 oz of Cascade @60 min, and 3.5 oz of Cascade with a quick chill at flame-out (added hops right after starting IC). 2. 3.5 oz of Cascade with a whirlpool at 212F (with heat) for 45 minutes... mostly stayed 190-200F. Chilled to 68F, pitched 1 pack of S-04 and 2 g of WB-06 into each (no rehydration). Shook to aerate. Same fermentation, beer temp 65F. 8/7/15 Dry hopped ~36 hours after pitching. Set beer temp to 68F to continue fermentation. More poweeeeeer to yah, Mike! Not scared of possible refermentation due to WB-06 being Sacch. Diastaticus? Or doesn't the beer leave the cold chain? Thanks for sharing the results. In my last IPA, I added Chinook and Columbus at the Hop Stand and Dry Hop as well. It turned out a delicious citrus and a little bit of pine, huum! Draft only, in-house. Should be OK with good process. Likely explains why it finished so low despite the high mash temperature. Hi Mike! Anything special done to the top off water? (Boil, salts, etc.) No 60 minute hops in V2? We've had some issues that I suspect might be var. diastaticus; it seemed to hang around in the fermentor for several batches, slowly (or not so slowly) building up banana flavors with each batch. Finally got rid of it with some peracetic acid and ozone; did you did anything special to get rid of it after the initial batch? Just cold water directly from the carbon filter. Correct, just whirlpool and brew-day dry hop for the 10 bbl batch. First batch is still fermenting at Sapwood... hopefully we don't run into those issues. Oddly the fermentation seems to have stopped higher than it did at home. This is amazing. Thanks for posting your results. 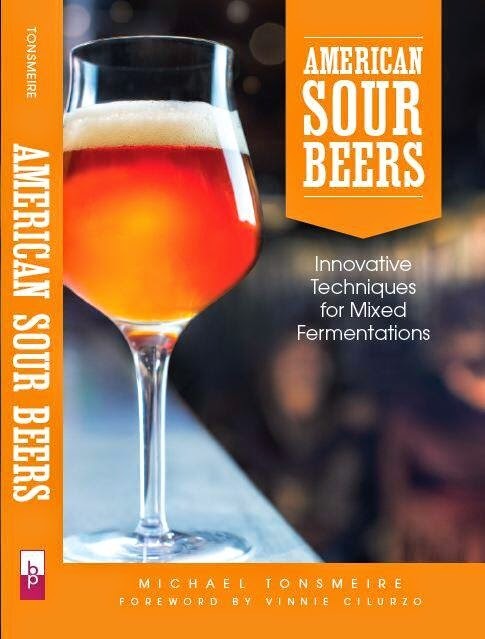 I was happy to read about the process of reasoning through the differences in a homebrew batch and a 10 barrel batch. Thanks for sharing the recipe. Is 9tsp phosphoric correct? I guess this would drop the RA waaay below around -200 which seems like a good target for a beer like this? It is correct for the 12 gallons, but the amount of acid required will depend on your water. I've got moderate carbonate, no reason to add carbonate and acid if you have more suited water.